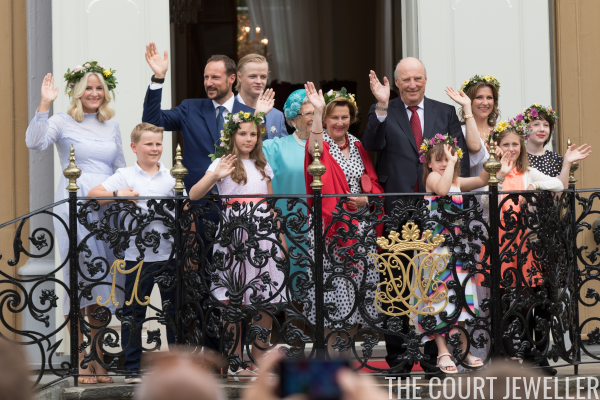 At a garden party, many of the royal ladies wore snapchat-esque flower crowns. 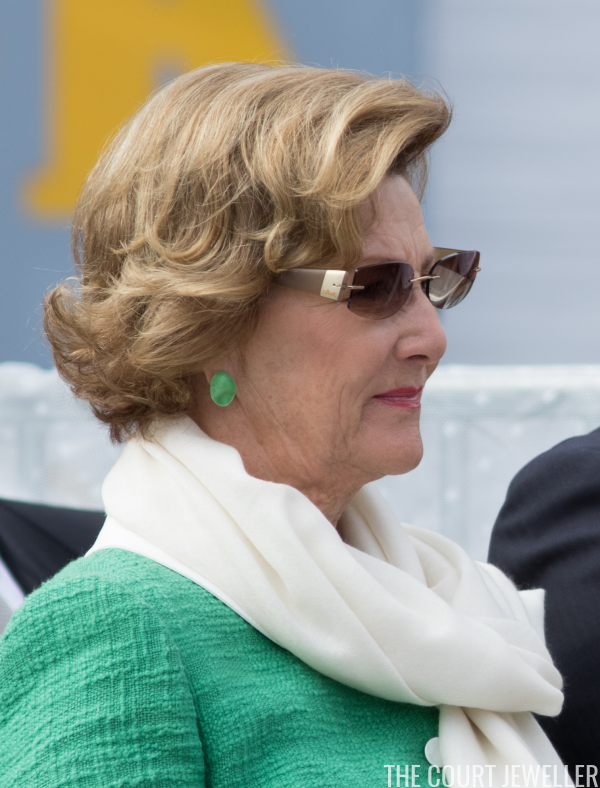 Queen Sonja accessorized with red jewelry, including earrings and a large beaded necklace. 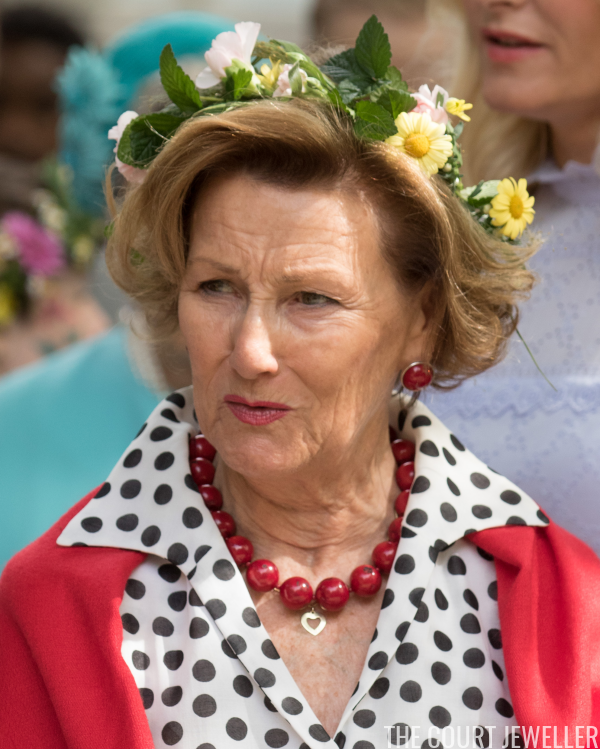 She layered her red beads over a delicate necklace with a heart pendant. 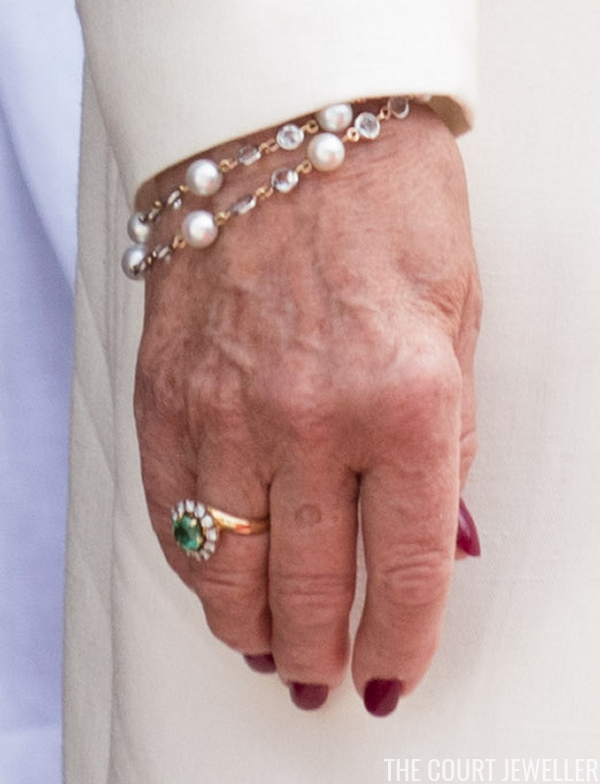 On her right wrist, she wore a red enamel bracelet, which is studded with gemstones. 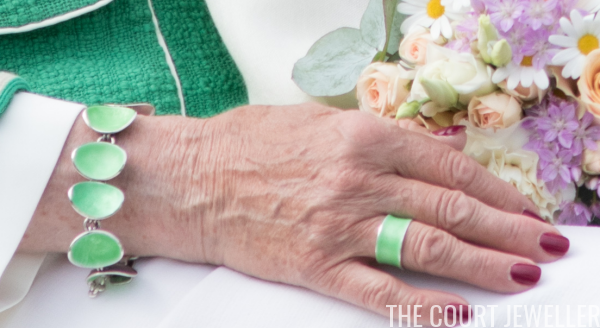 She also wore a matching ring, plus her wedding ring. 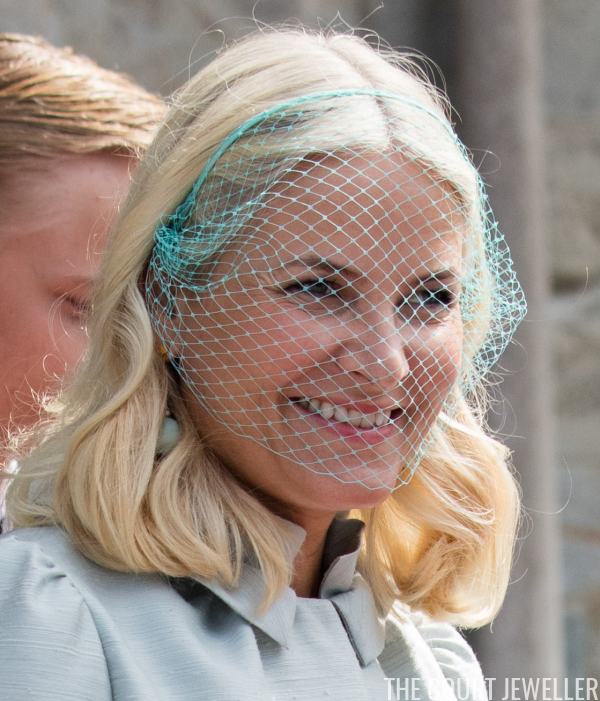 Crown Princess Mette-Marit let the flower crown do the talking, apparently wearing no jewelry. 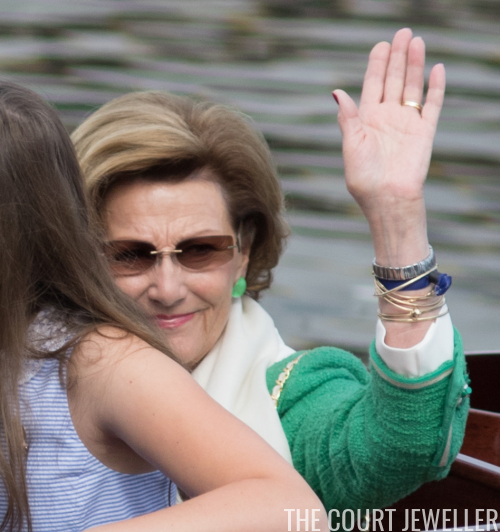 Princess Martha Louise wore earrings with small blue, faceted gemstone drops. 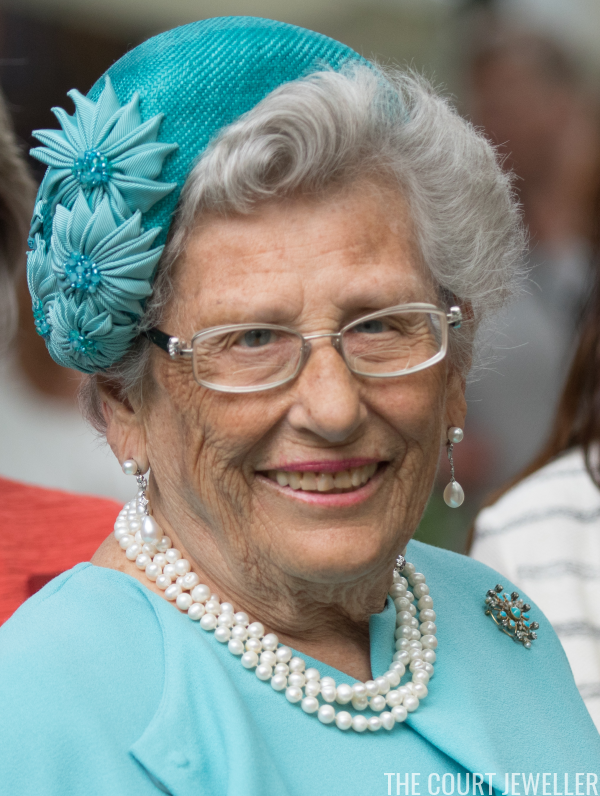 Princess Astrid wore pearls with an intriguing brooch. 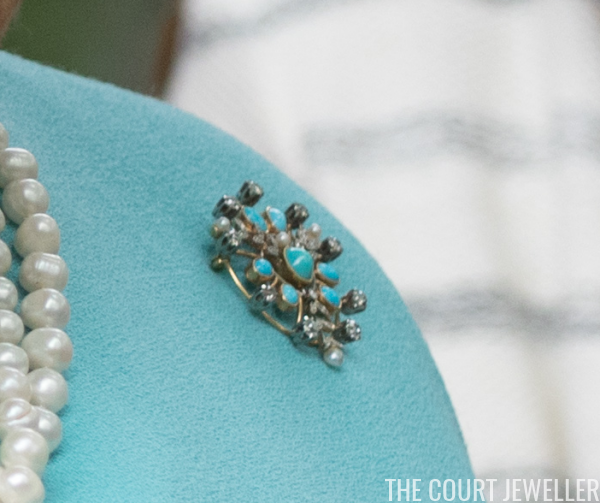 Here's a closer look: the piece is a radiating sunburst of diamonds, pearls, and turquoises. 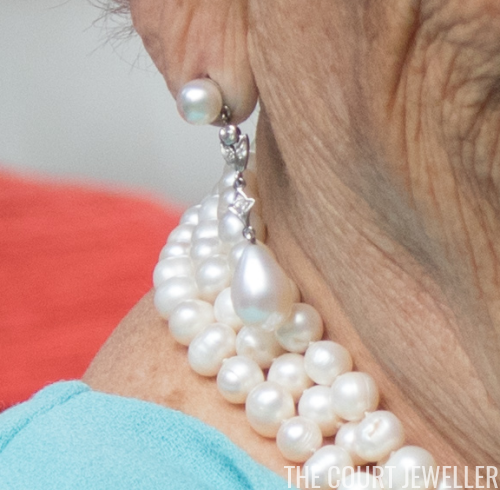 And here's a close-up of her pearl and diamond earrings. The family also made a visit to Trondheim's Ravnakloa fish market, arriving by boat. 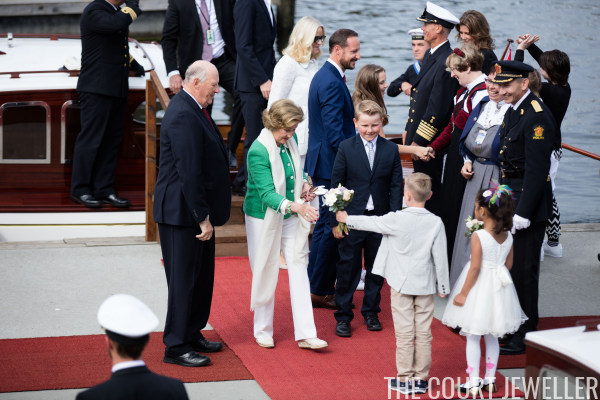 Queen Sonja matched her jewelry to her green jacket, wearing bright green earrings. It's hidden behind her scarf here, but she's also wearing a matching green necklace. 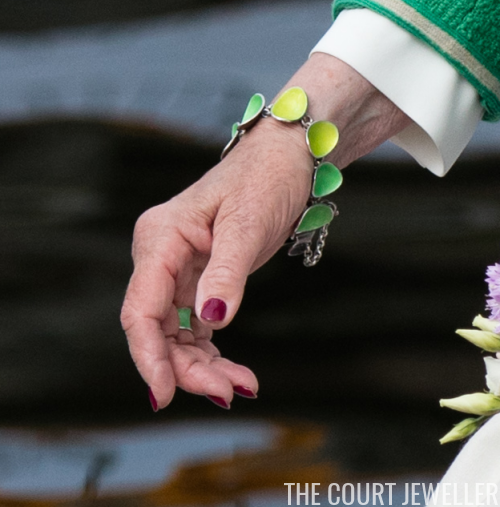 ...and the bracelet on her right wrist, as well as the ring on her right hand, also match the set. 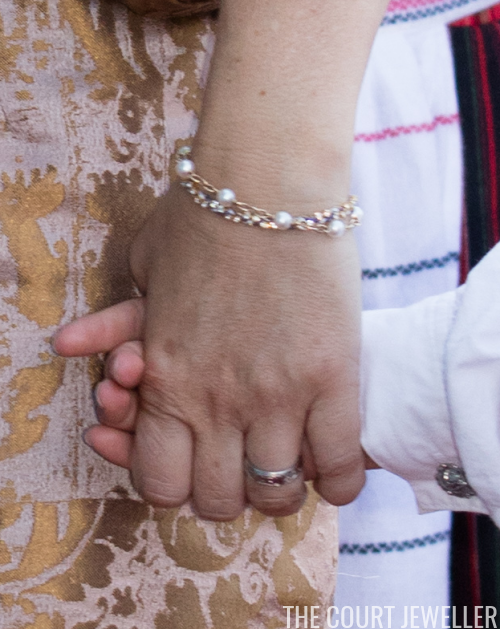 In some images, parts of the bracelet appear to be yellow. Not sure if it's a part of the design or a specific reflection of light. 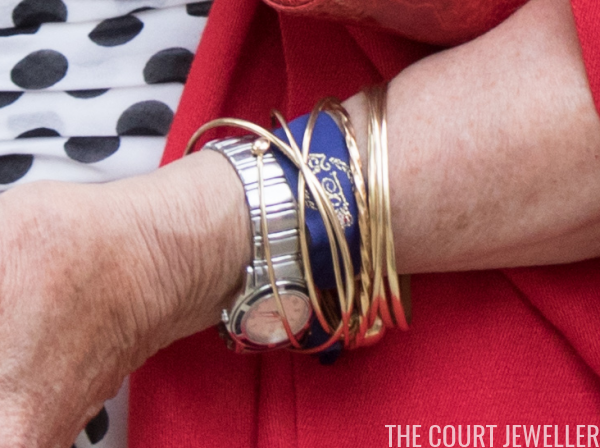 Sonja also wore the same bangles, watch, and ribbon on her left wrist, plus her wedding ring. 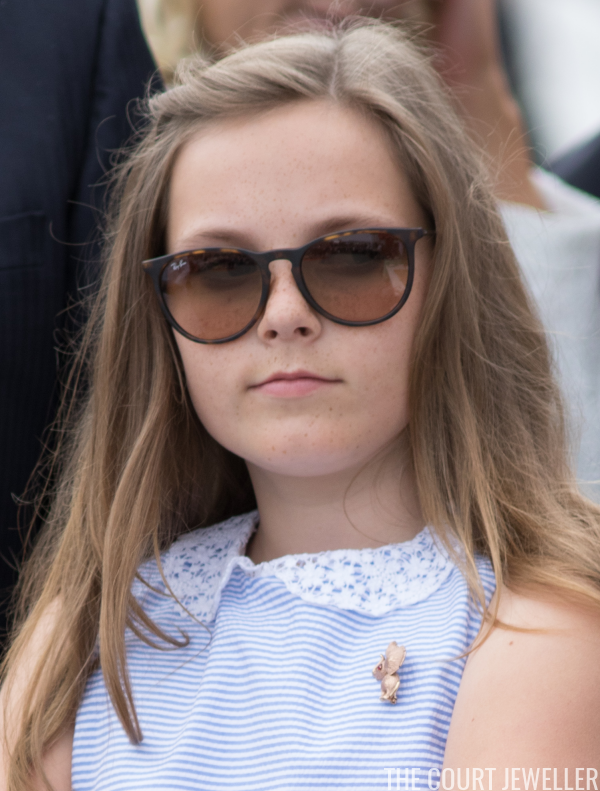 Princess Ingrid Alexandra, who has perfected her thousand-yard teenage stare, wore an animal-shaped brooch pinned to her dress. Appropriately, the celebrations also included a service at Trondheim's Nidaros Cathedral. 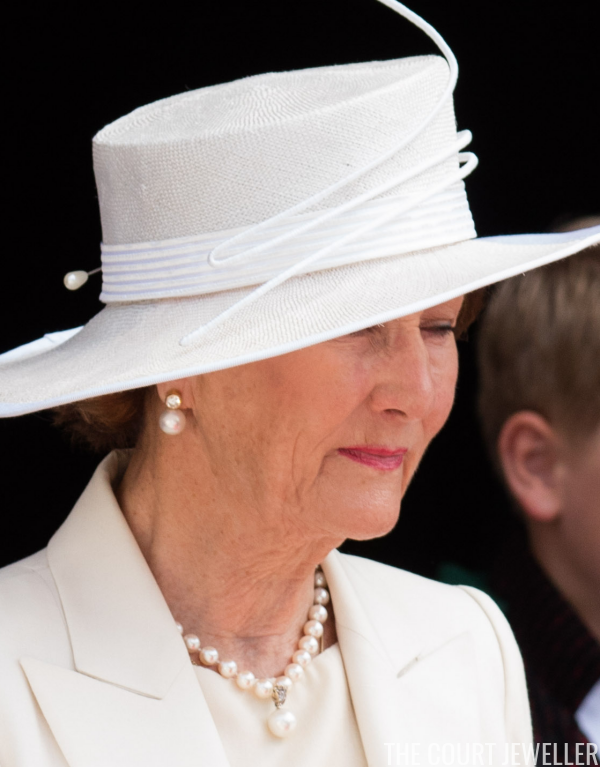 Queen Sonja wore diamond and pearl earrings, plus a lovely pearl necklace with a diamond and pearl pendant. 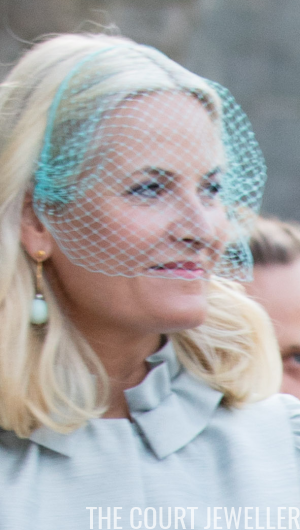 Sonja also wore a pearl bracelet with diamonds (or other "white" gemstones), plus a gorgeous diamond and emerald cluster ring. They were hidden in her hair (ugh!) 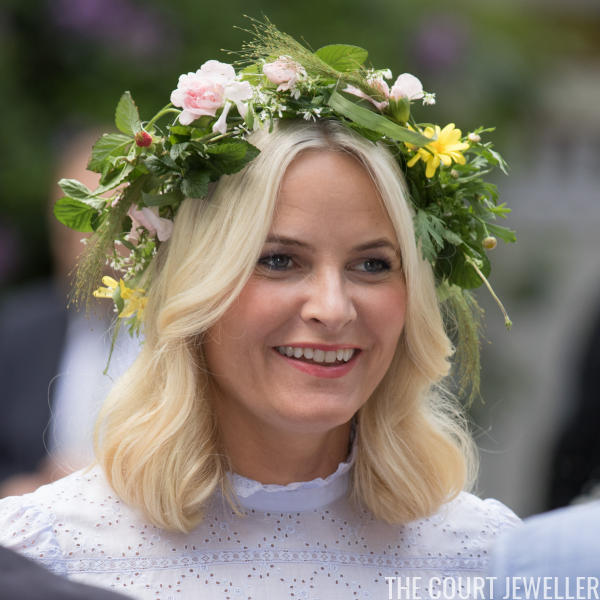 but Crown Princess Mette-Marit wore earrings! I'd really love to get a better look at these; they're pendant earrings with a gold stud and a spherical drop (which is perhaps light green or light blue?). Here's a slightly better view of the earrings. 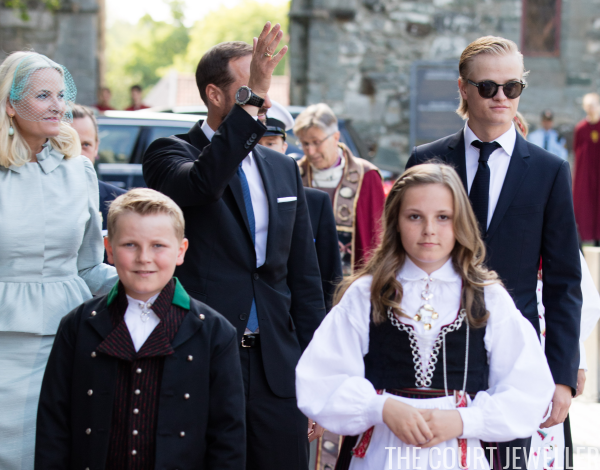 Princess Ingrid Alexandra and Prince Sverre Magnus both gamely donned traditional Norwegian costumes for the service, while their elder brother, Marius, made the event his own personal runway. 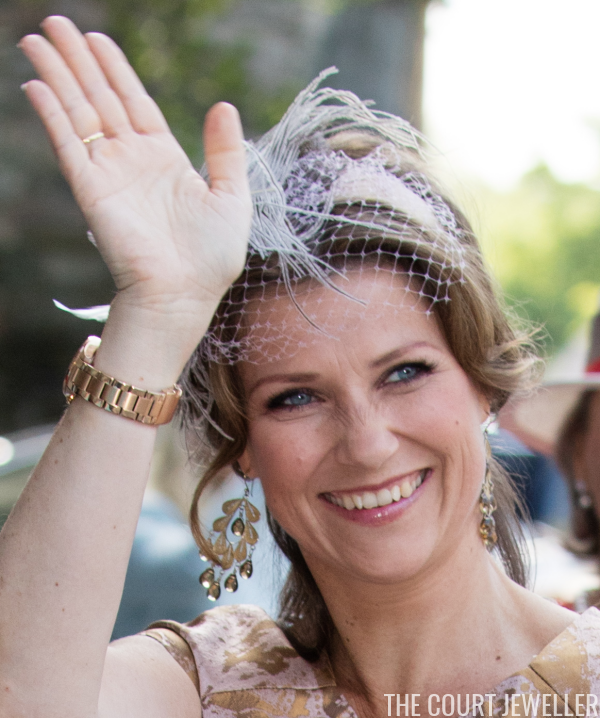 Princess Martha Louise wore a major pair of gold statement earrings at the cathedral service. 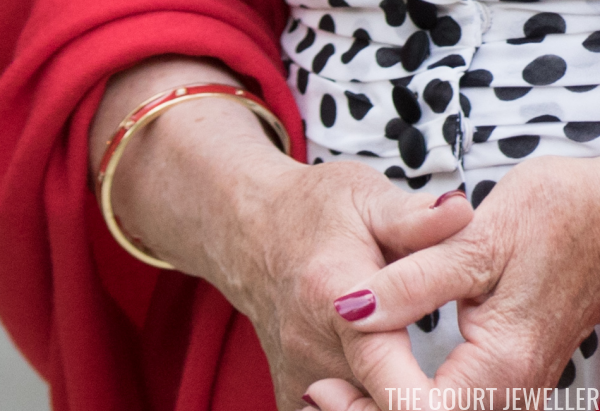 She also wore a pair of bracelets on her left hand, plus her engagement ring. 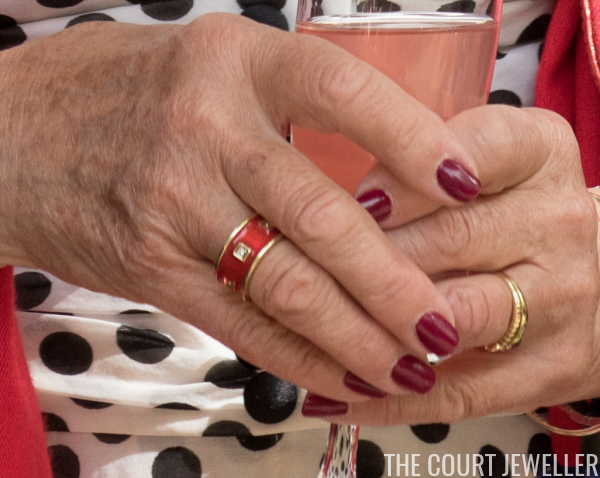 Which of these jubilee jewels were your favorites?